The Summer Art Market was one of my better ones in terms of sales, and also one of the hotter ones. After this cool spring it was not that surprising, but it didn’t melt the crowd- I had sales in almost every two hour block of the weekend, which also keeps the time moving. Thank you to everyone who came by and helped me celebrate a positive year! I had fun with the posters featuring my artwork, giving them away with sales and to my friends. Beginning with my “Best Of Show” award at 2017’s show (which landed me on the poster), I had a fun year; appearing in Westword, showing in the State Capitol, participating in MoPrint. So after a very busy Winter/Spring, it’s a month to enjoy some relaxation, and the World Cup. Tree of Life in Vacant Garden, Monotype, 30×22″, 2018. I enjoyed layering the colorful Mylar shapes to create a sense of abundance yet loss. I’m hoping to go in a different direction when I go back into the studio later this Summer. The World Cup is living proof of American exceptionalism. It’s by far the greatest sporting event in the world, but especially with the USA having crashed out, it gets little real attention here, not that attention span is something Americans excel at in sports viewing. Some overweight fool somewhere is on his couch, trying to convince himself- with ESPN’s help- that the four hour baseball game he’s watching has more significance than, say, Portugal v Spain, a gripping early clash of titans in the Group Stage. One for the ages? Hard to say, as there were many mistakes. Ronaldo jobs Nacho for a PK early, then Spain works their way- patiently with characteristic precision passing, back into it for a number of chances before equalizing on a brilliant Costa run. Patience is required to enjoy Soccer. More than any sport, it takes place in real time- it’s not bloated with commercials, fantasy league statistics, and long-winded analyses. One must actively read the ebbs and flows of momentum on the field, rather than passively await a scoring highlight or statistical benchmark, as in American sports. Now Ronaldo sneaks a counterattack goal past DeGea to bookmark the first half. Again, a mistake by Spain. But Spain is patient and works a brilliant set piece goal from Costa. Then Nacho gets redemption with a brilliant, trailing whiplash shot off both posts. Spain has clearly been the better team, yet they made two major mistakes at the beginning and end of the primer tiempo. They must close this out efficiently, or their WC will be in question from the get go. The Group Stage seems to offer multiple chances to get into a rthym, but for favored teams like Spain, it can be unforgiving. Another mistake, and Ronaldo lasers the equalizer. What a game! If the rest of the WC is as good as its start, perhaps Ronaldo- and even Putin- can be excused for taking his shirt off. The intensity ramps up with Peru v Denmark(0-1): the most intense 90+ minutes of football seen so far; end to end for most of the second half. The cruelty and drama of the stereotypically reviled one-nil: Peru will play entertainingly for all three matches, but will be eliminated after the second.“Insufficient guile” is Derek Rae’s assessment of a Peruvian FK late in their game v France. They couldn’t turn their exciting play into goals. That sums up their tournament. Mexico make no mistakes. Their tactics are excellent against the World Champions. The first half they show a fairly high press with very concise long balls over the top to keep Germany out of rhythm. They stay wide and keep up a nice tempo- short, short, long; basically playing Germany’s slow midfield press against themselves, lengthening the field, where Germany loves to shorten it. The goal is a brilliant bit of cutback and a seeing eye shot by Lozano. They bunker a bit in the segunda tiempo, with Germany slowly shortening the field, and Mexico with just enough counter to relieve pressure, though they misfire on all. GK Memo Ochoa is there for the inevitable final siege. Mexico puts themselves in good position to go through, if they can maintain their aggressive tempo. This plays out in the second round of games, where the stakes are suddenly higher, and teams walk a fine line. Mexico v Korea (2-1) and Germany v Sweden (2-1), a late thriller with one of this tournament’s many extra timegame winners= one of the more thrilling days of the Cup, and it carries over into Sunday with Japan v Senegal (2-2), and Poland v Columbia (0-3) which actually puts Senegal in a bad place in the final match day. This, too, would prove significant. Monday, the first day of the third round, is also dramatic with Spain coming back (2-2) and Portugal being hauled back (1-1) intense, complex, Video Assistant Referee-flavored battles that decide knockout round pairings. France v Denmark (0-0), not so much. The commentators are fond of saying “This game needs a goal”. Sometimes that’s all it needs, but here it’s a stultifying bird-in-the-hand type game between two teams who already have what they want, and little to gain in future pairings, unlike Mexico, who have a real incentive to avoid Brazil in the next round. So we get the only nil-nil of the Cup so far, as the crowd whistles, but it’s plenty enough to perpetuate the soccer stereotypes, I’m sure. Now, today, it’s the last day of Group Stage -always bittersweet. I’m on the couch, well-coffee’d and watching an intriguing start for Columbia v Senegal, two dangerous teams. Senegal does take their usual aggressive attitude toward attack, but after half time, Columbia’s quality and resilience begin to turn the tide. Final score- yes, 1-0. Senegal is out of the knockouts on a tie breaker. I had already watched a complete collapse by Mexico (not to mention Germany) on replay last night. But Mexico ends up on the right side of the math, and goes on, at least as far as Brazil. Now, there is bacon in the skillet and I’m awaiting the kick off for Belgium v England. Both teams also already through, but the well regarded, high-scoring Red Devils and the underrated Three Lions have a lot to prove with top of the group at stake, and I’m not expecting nil-nil. Commentators are the erudite Derek Rae, and former WC player Ally Wagner, who retains her field-level feel for tactics, and is thus far unsullied by pundit-speak. Fox has had an up and down WC so far. Rob Stone is a football lightweight, Lalas apparently the designated loudmouth, with Terry Bradshaw the model. Rae and Wagner are firmly in the “ups”. We’ll see what kind of match we get. Group Stage has been surprising and very evenly matched. Even the big boys- Brazil, France, Spain, have struggled to find rythym, and some- like Germany and Argentina have not found it at all, or rarely. There’s been a lot of late drama, and half my bracket is in shambles. My predicted finalists, Spain and Brazil are still alive, though. Baseball and NFL are for bean-counters. Baseball flatters itself that its cheap stats make any of its long slogging progress toward September and October meaningful. When the brain rattling violence on the claustrophobic gridiron is done, the last team to do an end zone dance will be declared “World Champion”, having never ventured out of the astro-turf infested suburbs, none of their “highlights” having aroused any interest in the world. To Americans, soccer’s a game that doesn’t “count”, but in 2026, The USA will find out that no travel ban will keep it out. My own experience with other Americans, especially those of my generation, who created the hype machine that is the Super Bowl, and are often heard extolling the copious commercials- is a frustration. Even friends who profess a positive attitude toward the game, when they can be coaxed out to the park, seem to see the jockeying in the midfield as some sort of pause in the action, rather than integral to it. They treat it as an opportunity to drift into triviality, as if it was a commercial break in NFL, or the interminable tics and twitches between pitches in baseball. Soccer, where one pass can define an entire game, measures itself on a continuum of emotion, it’s a game defined by persistence of the heart. It provides few defined periods, incremental territorial gains or mandated possessions. Politically, culturally, and especially in sports, Americans have little patience for the grey areas of life. They are considered “boring”. Soccer is poetry in motion, possibility centered squarely in the moment. It’s the game that breathes and sings. A team (and nation) in the 80th minute of a 1-nil match are only seconds from a blowout disgrace, a life-saving draw, or a glorious fight back triumph. It is always up to the players. Each one on the expansive field has the power to change the result. Even for Ronaldo, it takes a career for any impressive numbers to be tallied up, but his greatness is visible on the grass long before then. Greatness and glory poised on a knife’s edge. The whole world is watching, not counting. To the world, it’s only the game that counts and thus it’s the only game that matters. Again, SAM! The Art Students League Summer Art Market posters are out, and guess who’s the poster child? It’s a reward for winning “Best of Show” in 2017. 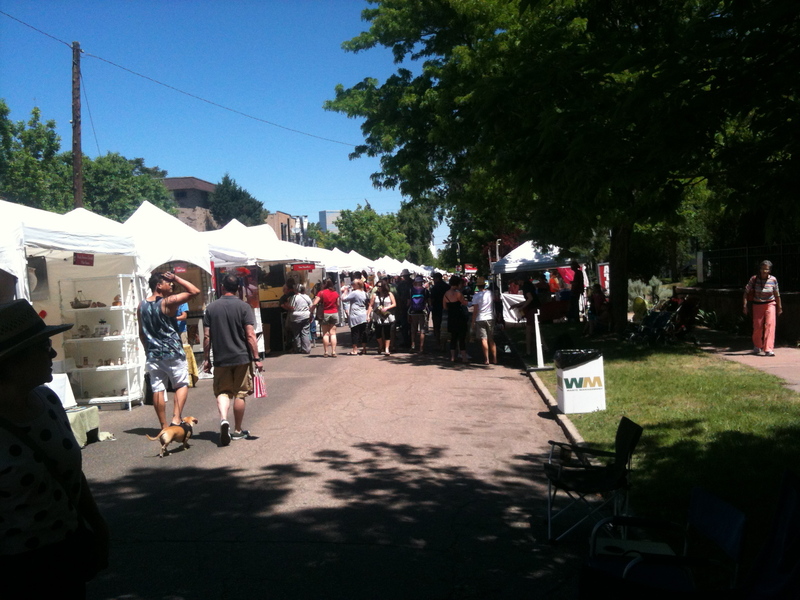 I’ll be there again this year in booth, number 97, on Grant St. between 2nd and 3rd Avenues. I’ll have new work, as well as some older stuff from the flat files, at older prices. And I’m giving signed SAM posters, while they last, with every purchase of $150 or more. I have enough for a typical show, though I’ve had shows where they wouldn’t have made it to Sunday afternoon, so get there early, as I’m not sure if I can get more. The League will also have them available for a donation in their booth. In addition, I’ll have a few copies of the beautiful catalog for the now dearly departed Open Press’ 2014 25th Anniversary show. 9×12”, 64 pgs, with over 50 of the best printmakers from Denver and beyond, including moi ( Really, Nick Cave is in there, along with Dale Chisman and Joellyn Duesbury). These are signed and free with any purchase of $400 or more. SAM is a classic, and a real social scene, featuring 180 artists and the first blast of summer. I hope you’ll come down! Classes: I’ll have three this summer, and the first, Monotype Starter, June 19- July 10 is already full. You can call the League to get on a waiting list in case of last minute drop outs, which are common. The other two, Monotype Portfolio, July 24-August 21, for experienced printmakers, and Monotype Blast, an all day Saturday sampler on August 4, are filling, but if you have questions, you should be able to stop down at SAM and ask me, then register at the ASLD booth. Fair warning: Blast is half full already, so it will eventually fill. Other news: For those who missed it, I was featured in Westword’s 100 Colorado Creatives 4.0 Blog in March. It’s a nice article by Susan Froyd, along with an interview, lots of pictures and a video. I’m hoping to debut a new workshop in Fall. It’s called Monoprint Mad Science, for intermediate and advanced artists. 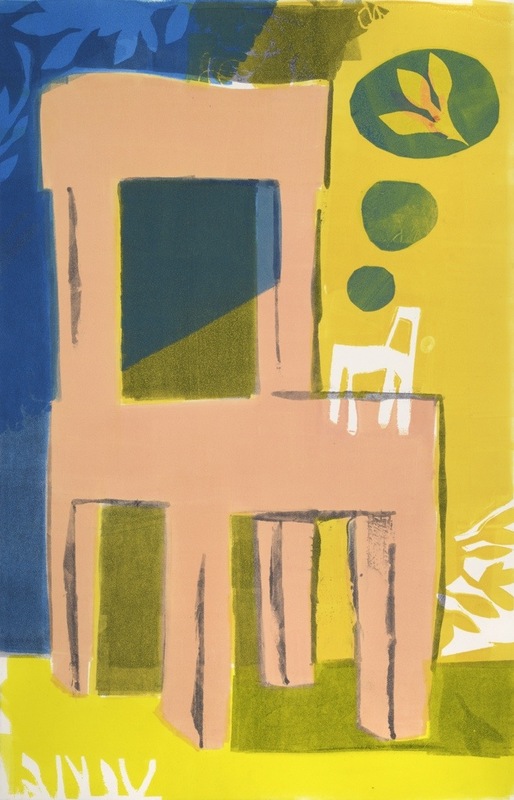 Monoprints are monotypes with repeating elements, such as drypoint, Chine Colle’, and polymer etching, etc. It’s starting as a 4-week workshop, which will keep it affordable. I’ll get confirmation sometime soon. It’s been a very fun year, and people taking my classes and buying work make that possible. Thank you so much for your continued interest. I Hope You All Enjoyed The Show. I have a post I didn’t have time to finish and post last week, on the Beatles’ 50th anniversary of the release of the Sgt. Pepper’s Lonely Hearts Club Band LP, June 1. I didn’t post it with the rush to prepare for the annual Summer Art Market show. That went okay, with the main news being I won “Best In Show.” I’ll put up an album of photos soon. But here’s the Beatles post, and I’ve got another that I never posted, so I’m going to finish that, too. It was 50 years ago today. We’ve been seeing that almost obligatory headline a lot recently, as the media return to a longtime, can’t-miss subject: The Beatles, and the anniversary of the release of their ground-breaking Sgt. Pepper’s Lonely Hearts Club Band album. Everyone old enough will have memories of this release, which was a watershed in both artistic and cultural, even political history. Its effect is probably emotional for some people who lived it, and difficult to describe to those who weren’t there without using hyperventilated superlatives. The Beatles were sort of magical at that time; the hair- a big issue then, the flippancy, the “more popular than Jesus” defiance. There were some Goldwater Republicans and what we then called “Jesus Freaks” who hated them, but no one else did. It’s important to note- you young whippersnappers! -that no later artist, no Prince, no U2, R.E.M., Beyonce or Katy Perry, has ever had that grip on the imaginations of the young. Suffice it to say, I’ll never be all that distant from Sgt. Pepper’s. It seems a part of me, and retains its immediacy. For one thing, at that time Sgt. Pepper’s was the only show in town. But it’s become fashionable to place it behind Revolver in the Beatles’ canon. Like many, I’ve read a lot of books on the Beatles. My two go-tos, musically, remain Tell Me Why, by Tim Riley, a song-by-song analysis of the musical and lyrical structures of all their albums, and The Complete Beatles Recording Sessions, by Mark Lewison, a day-to day record of their studio work with George Martin. Both provide critical analysis, as well as cultural and biographical context for their many moods and innovations. As I’ve mentioned here before, The Beatles Anthology albums (Vols. 1-3), with their out takes, creative progressions and studio half-steps, are an indispensable companion. Also search out The Atlantic’s The Power of Two, (July 2014) by Joshua Wolf Shenk, a shorter analysis of what made the Lennon and McCartney collaboration so effective. In 1967, others, notably rivals The Rolling Stones, were still standing on the shoulders of blues giants. The Beatles however, had leveraged their unassailable chart postings by quitting touring, and had unlimited studio time to explore pop, folk and psychedelia. On Pepper’s, the sheer power of George Martin’s control room vision can no longer cover up the centrifugal motion of Lennon and McCartney’s artistic intentions. On Revolver, we hear McCartney’s R&B masterpiece “Got to Get You Into My Life” moments before one of the first great 60’s psychedelic/mystic songs, Lennon’s “Tomorrow Never Knows”. They are clearly moving apart musically. But with Pepper’s, their ideas are still engaged in metaphorical dialog, thanks in part to its loose concept (faux Victorian psychedelic nostalgia, which quickly became the rage for pop bands, and eventually informed steam punk genre fiction and fashion). Three songs epitomize the Pepper album’s failures and its triumphs. One is on the album, two are not. The first is “A Day In The Life”. It is the emotional core of an album that has been criticized for not having one, when compared with the worldly love songs and social realism of Revolver. But its disjunct between bouncy pop and existential questioning is part of its brilliance, and the Atlantic article defines this as part of Lennon and McCartney’s collective genius, the tendency of John and Paul to respond to each other’s ideas, in the same way that the dreamy search for identity in Strawberry Fields plays off against the uncannily superrealist nostalgia of Penny Lane, the other two songs I allude to above. This is the real problem with the record: it’s not complete. In early 1967, their record labels Parlophone and Capitol, anxious that a cash cow single had not been seen for all of 10 months, were pressuring the band, just liberated from brutal touring schedules, for a new 45. The fireman rushes in, indeed. The labels’ release schedule was out of sync with their creative one. Strawberry Fields and Penny Lane were two of the few songs ready. But by custom, these midterm singles were not included on the subsequent album. By late April, work had begun on several other songs, and only a month after Pepper, the “All You Need Is Love” single is released. No song was ever released from SPLHCB as a single, in fact. “Strawberry Fields” and “Penny Lane” are included in December on another Capitol mash-up, the “Magical Mystery Tour LP. It’s treated as a trivial oddity if mentioned at all, but is in fact a pop artistic tragedy on a par with a lost Shakespeare play. Or perhaps it’s enough to state that George Martin called the songs’ omission from the record “a dreadful mistake”. He’s right- only those two songs refer both to the floating anxiety of Lennon’s distant, ironicized dreamscapes brought together with McCartney’s photorealism in one disturbing “Day”, between morning newspaper and first cigarette. In A Day In The Life, the Beatles themselves puncture their own nostalgic Victorian band conceit before the record even ends. As Riley points out, in a useful discussion of the song’s metaphoric soundscape, the spare acoustic guitar opening of Day emerges from the fading illusion of Sgt Pepper’s (Reprise), and Lennon’s dreamy absurdity ( “4000 holes”) asks us to ponder what is real and what is illusion. We hear an alarm clock; the dream is over- a studio alarm clock included in an early take as a time marker inspires McCartney’s man on the bus smoking segment, which plays what is in this context, as quotidian zombie horror, as his working stiff rushes for the bus. This daydream plays off perfectly against Lennon’s existential nightmare. Without Penny Lane, however, The crystalline nostalgia of McCartney’s hyperrealist suburban vignettes (When I’m 64, Lovely Rita) can sound gratuitous and superficial next to the anxiety-prone absurdity of Lennon’s hallucinogenic Victoriana ( Good Morning, Mr. Kite). These songs, in turn, sound like LSD fripperies without the primal identity quest (“No one, I think, is in my tree”) of Strawberry Fields to anchor them. “Fields”- about an orphanage grounds, and “Lane”, about an everyday intersection, center the ideas of the Pepper sessions as no other song, other than “A Day”, can. The metaphoric backstory of the album begins with these childhood memories and ends with Paul and Martin’s orchestrated crescendos, knitting disparate sounds and leading to a note of attenuated anticipation, a sort of definitive ambiguity. What’s next, the long closing note asks? Martin was excited by the creative effusion, and anxious to return to the studio. But the band, in retrospect, suddenly seemed adrift. “A crowd of people stood and stared” referring perhaps, to the just-exited Sgt. Pepper’s audience? Or to the Beatles themselves? Nobody was sure what exactly they were seeing. The disjunct between Lennon’s dark apocalyptic dreamscape; and the sunny clarity of McCartney’s blue suburban skies is explained, as a dream within a dream. It all adds up to a kind of existential, hallucinogenic identity crisis, one that mirrors the one many of us, in large parts of society as a whole, experienced then. But the Beatles, now without Brian Epstein, might’ve been having one, too. It brings up the question of what might have been released instead of these two songs, and the correct answer is, really, “Who cares?” “When I’m 64” was the other song ready in February 1967, and would be no great loss to the album, where it’s more of a breathing space between more meaningful songs. Same with “Within You Without You” which fits only by virtue of geography into the album’s loose concept. But that brings up band politics, as it was Harrison’s only song on the album. So why not include them all? Recording technology was apparently an issue. Sgt. Pepper runs 39 minutes, Revolver, 35. Mostly, though, it was commerce triumphing over art. For the Beatles’ part, they’d made themselves clear on this issue with the “butcher” cover to the spurious Capitol Records release Yesterday and Today, but never seemed to have returned to the issue. “Well I just had to laugh” is, as Riley notes, a token of resigned disillusionment. By the time Pepper’s was released, they’d recorded several sessions for Magical Mystery Tour. Self indulgence was rearing its head. On the very day of the Pepper album release, Lewison reports the Beatles in studio, recording unplanned and “frankly tedious” jams. Perhaps it was the Beatles themselves who had lost their emotional core. Did they have an inkling that some element of magic had gone mysteriously missing? Had hubris set in? But if the album does fail, it’s a failure of execution, not of artistic vision. Sgt. Pepper’s, always great in terms of its cultural influence, if not in terms of its artistic cohesion, was sacrificed to an already outdated business plan. Textures and graphic effects are a way of bringing energy to a print composition. A highly detailed texture will attract the eye and demand attention, a subtle one will invite mental rest and contemplation. A heavier, darker texture or a very transparent one will tend to create depth by playing off what’s behind or underneath it. In this three staged monotype, I had some fairly unique coloring and a balanced, if plain image, and I put it aside with a vague feeling of disappointment as it really didn’t have a lot of intrigue. Intrigue can be defined in prints, probably in all art, as something, a bit of mystery or surprise that might keep the eye exploring the picture, possibly to extract meaning ( or determine if meaning is indeed there), or to solve the puzzle of its composition, or simply to bring the visual exploration to a fairly logical stopping point. In this case, I didn’t want to give up on the print because I liked the sense of calm, or is it desolation? which I think comes from the pink light and the fairly empty expanse on the left side. So I wanted to heighten that distance and light, without cluttering the picture. I did this print last year, and while I loved the strange colors and stylized interplay between positive and negative elements, it seemed too sparse to call finished. The picture was also a bit sparse though, lacked a real focal point and featured mostly hard edges. I wanted to add a bit of visual richness and narrative movement while maintaining the graphic simplicity. First I added in some more visual elements in the foreground which enhanced the designerly, modernist look of the first layer, and although these are also hard-edged shapes (created with mylar overlays), I think the addition of more complexity in the foreground makes the emptiness in the background more pronounced. I added some foreground darks to create a focal point in opposition to the rather empty background. 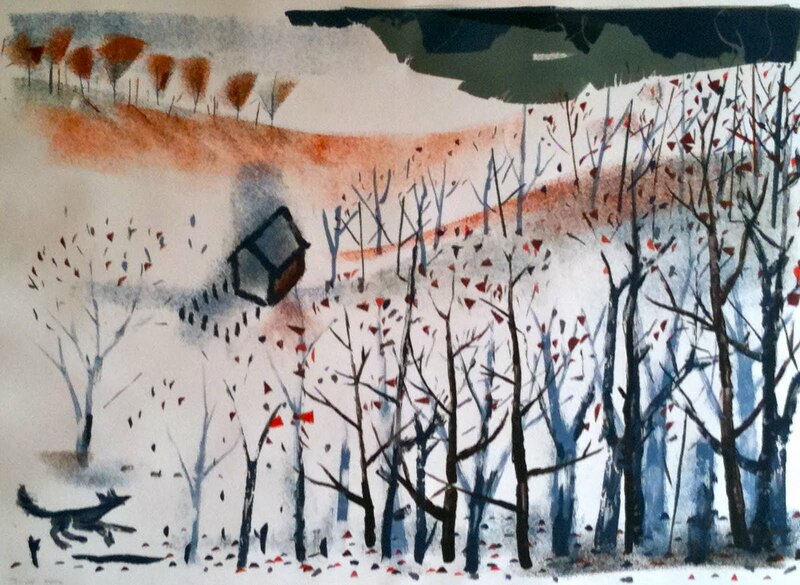 Then I thickened the glade at the right avoiding too much clutter, by adding some trace monotype lines. I rediscoverd trace monotype, a favorite from Paul Klee’s early work in my art history class days, and decided to experiment with it to see if it might add to these pictures I’d never finished. It has a fairly spontaneous and softer-edged feel to it as opposed to the hard edge of the mylar stencilling, which might, given the subject ( strangely lit glade) add some visual balance. The softer-edged elements were placed in front of the earlier graphic elements, not usually how you do it, but as in photography, the depth of field is being manipulated to sharpen and highlight middle ground elements, an example of what I mean by visual intrigue. When you highlight or sharpen the middle ground, you are, in effect, asking the viewer to “enter” past the foreground elements. Like pushing to the front of the crowd for a street busker, say, it asks for a bit of commitment. It added a bit of “dirty” look to the print, which adds an edgy but also timeless feel to the modernist hard edges. Blacks ( not too heavy) always add depth by bringing out color and balancing tones, which here were sitting mostly in the middle-light to middle-dark range except the ghostly whites. I used the trace mainly for spindly forest brush (plant) images and ground debris which adds a bit of suggested perspective and realistic “bottom” to the pic, but also a kind of synaesthesia in that one can imagine the crackling of twigs, which draws one in to the place depicted. It’s also somewhat calligraphic and hints at a story in the scene. The second layer of leafy designs in mylar plays off the twigs to create a sort of diversity of textures and heightens the original play of positive negative space in the pic. I like that the imagery is denser, but the two image sets are now in a bit of visual tension with each other in a sort of necker cube shift of dark and light. Is the white log stencil some sort of border treatment, or is it a log that has shifted to another dimension. A ghost log? I always enjoy signal-to-noise problems, and this one suggests information degradation or decay, since it exists at the edge of the picture plane, where an image might be expected to fade anyway. Whether this all works is of course for the viewer to decide, but as the “first” viewer, it made me happier. This was a print which seemingly had no chance of ever being seen by the public, until I decided that other textures might make it just intriguing enough to show ( Yes, I have to see intrigue, or at least stylistic interplay in something before I can bring myself to show it). It seemed to lack any sort of visual grace or interior dialog beyond the pink and brown coloring, which I always loved, and which probably kept it near the top of the stack of unfinished items, rather than buried in a flat file. It seems to have a fair amount of depth and “placeness” in it now. It’s a place I would like to go to and walk around in, so I went there. You can see it and judge for yourself at the Art Students League Summer Art Market, June 10-11, Booth #96, where I’ll be showing it along with work by my booth mate, Taiko Chandler. The finished piece has quite a bit more texture, including rub marks from the trace monotype. Sincere thanks, as always, to the folks who came by during the Art Students League Summer Art Market a couple of weekends ago. It’s always a fun show, and this was another successful one. It’s also a lot of work and often comes during the year’s first full-on heat wave, as did this year’s, so I rewarded myself with a week’s vacation on the back porch with a stack of new reading material. So I haven’t posted, but expect a book post soon; it’s already being written. I also hied myself down to the DAM for a first peek at the “Women in Abstract Expressionism” show that is attracting a significant amount of national attention. I wanted to get in while the conversation is still just beginning, and I’m joining it soon with a post of first impressions which may be posted here as quickly as a day or two, as I’m in the final edits with that. My Summer workshops have started again. Most are sold out, but one, “Monotypes for Advanced Beginners“, starting in July, still has space left at last check. It’s intended for people with recent printmaking experience, so contact me if you are in doubt. If you missed out on one of the others, the Fall schedule for those will be confirmed, and posted here in not too long. I’ve tentatively added a free Meininger’s Demo and Dialogue to the schedule for November’s Denver Arts Week. I’ll post on the Workshops page when I confirm date and time. I don’t have a lot of free stuff going on this year, but the Meininger demos are real fun, with a great space and usually a good crowd, so I thought you should know. I hope you are having a great beginning of Summer! It’s hard to pick up the thread in the studio after an absence. I’ve been making regular time there since January, but Fall and Summer were mostly a loss as I worked to pay off debt. Glad to be making progress on that, but producing work is the only way to increase sales, which pay debts, too. I started with some chairs because they are simple enough visually to try new things, yet loaded with enough emotional connotation to make them interesting. I call them my “Place” series as I seek to establish my own place in the studio, and in the wider art world around it. I sometimes use chopped up mylar stencils from older work to create patterns and textures in newer work. It feels regenerative, and doesn’t stink as much as a mulch pile. My next show will be the Art Students League Summer Art Market, June 11-12, some of these pictures will be available there. Unlike past shows, I’m sharing a booth at the #SummerArtMarket2015 with another monotype artist, Taiko Chandler. I’ll post some of her work soon. It has allowed me to dial back the preparation of the small-to-medium-sized prints that usually sell there in favor of some larger work, which I will still need more of to crack into a more sustainable position from a business perspective, but also to more fully develop creative ideas. I’ve worked hard in past years at creating a large inventory of smaller pictures, so I should be able to fill a half of a booth to please the mostly smaller, middle income collectors at the show and continue to make bigger works for a higher end gallery market. I’m also mentoring to a certain extent. Many past students in my workshops have been moving into a more professional approach to creating and selling and the SAM is a good place to test yourself. I try to help with some of the more practical concerns of presenting, showing and selling art. Taiko is one of those artists, though she’s made a fair amount of progress without me so far, so I find myself wondering what her very polished work will bring to the booth in terms of eye appeal and new visitors- two heads are better than one? At some point, usually in May, those practical concerns start to outweigh all the aesthetic issues. I’m sorting, wrapping, and framing art. I’m digging through the garage to make sure I have important items to transport it, hang it and keep it dry.What’s an important supply item for artists? Trash bags! They help you to transport, store and protect art at an outdoor show, and they double for the same purpose for buyers bringing it home. Art supplies include bungee cords- mundane items, yet so useful when the wind comes up. I’m also making art, mostly smaller items again to fill out the bins and to cater to beginning collectors with small walls. I’ve made some larger work, especially in April and early May, which I’m taking to the photographer this week. I’ll post some pictures and add them to the gallery next week. I’m doing another free library workshop this week as well, and my Summer workshops are open for registration now. The weather is still wet and cool, so I’m still reading a lot too. 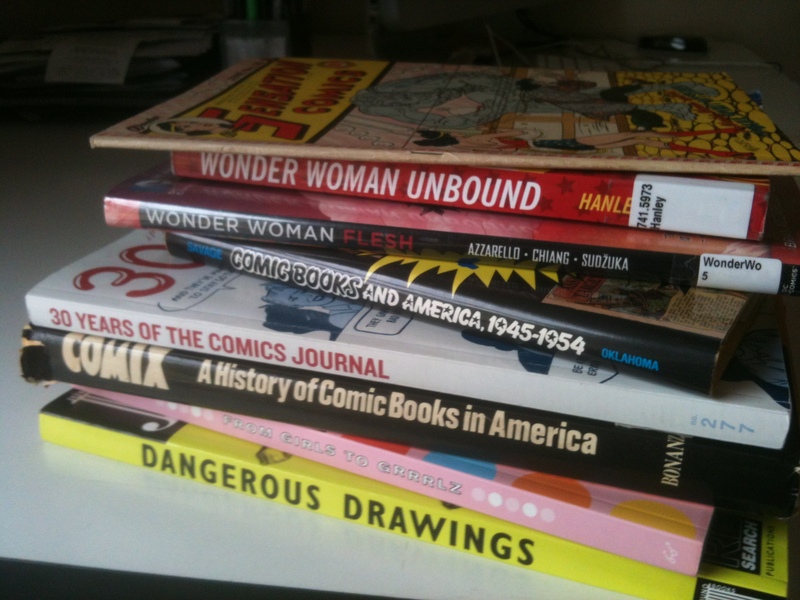 I’ve started a “women in comics” post which will inevitably grow too large and be chopped into separate parts. My comics posts, as I’ve said, are an attempt to post something that taps into a larger conversation about the culture wars than just my studio work. It allows me to “think out loud” about the things I’m reading, which in turn helps me to process them. It turns out that conversation -and the reading stack- is large and getting larger. My supposedly brief foray into mainstream comics has extended into a larger inquiry into comics’, and all pop cultural, expression of societal change, and that subject is starting to get a lot of attention in some very high places. There’s actually a lot of material out there, and I’ve enjoyed digging into it. I imagine I’ll continue posting about where my library and bookstore excursions lead me. Art Spiegelman (Raw Magazine, Maus) speculates in Dangerous Drawings that comics started taking off in the mid-19th Century after printing presses began the expansion of reading into lower, less well educated classes of society. Libraries often use comics to perform the same function with immigrant populations today. Marginalized creators, too, such as Second Wave feminists in the 70’s and 80’s could get access to cheap printing and spread messages in underground comics about social change. I talked last time about organizational things that make the Art Students League Summer Art Market a favorite show of mine. Details like this make a show meaningful and worthwhile for both artist and public. But what makes it personal and fun- people. The SAM has retained, throughout its growth, the feel of a neighborhood block party. That makes it fun to do all the work. I’m following up on this show in case anyone wondered how it went for me. It was great! I had a lot of help this year, so physically it was easier, though it’s always draining, especially when the heat hits. But just talking to all the people is really rewarding. I get a lot of returning buyers at this show. They are very loyal, very enthusiastic about my work and the League and the SAM as well. One woman, Nicole, told me that her entire art collection comes from this one show! The usual Saturday morning feeding frenzy didn’t really happen this year. Instead, it was steady traffic all weekend long. There are a lot of events in Denver every weekend now, but somehow people still made time for SAM. It’s become a destination for longtime and beginning collectors alike. I can’t recall this happening before, but this year, Sunday had more sales than Saturday. Overall, it was my 2nd or 3rd best show ever, so I was very happy. Owen and Jennifer, my brother and his wife, always come down to help break down. We had beers toward the end of the show, and my friend Dee and her friend came by, we had a lot of laughs when we should have been packing up, but when we did, the traffic and loading was smooth and easy. Then Owen and Jen and I went for pizza and tasty craft beers in our neighborhood. The show pays bills yes, but also serves as a great social occasion. I meet new friends there, too, then have to be reminded of their names next year, though I try to remember. It usually takes me a week or two to get back into a steady schedule after this show, but I don’t have that luxury this year. A workshop begins tomorrow, a large piece is being shipped to Connecticut, and this web site needs a bit of fleshing out. So I spent a couple of days watching soccer and now- back to work. Related side note: I was really too busy preparing for the show and didn’t notice that several comments had come in on the new site. It turns out that though I criticized WP’s clunky, glitchy publishing software, their spam defense is great. Too great- among the many links for “Fake Oakley Sunglasses” etc, I found several comments from friends and comrades. I must have assumed I didn’t need to check the “approve” list- rookie mistake. I’ll learn, and I apologize for late replies. I welcome comments and discussion of any topical matter, really, and in the next few weeks I’ll link to some of my favorite blogs and sites to get the discussion rolling. I hope to write a proper post soon, as it’s been a while. I’ve been pretty busy, ironic since there’s actually plenty to talk about. But to keep things fresh, here’s a link to what I’ve been working on in the studio. I like the house images, but obviously did not want get away from the interiors, either, and the best way I can explain that is, the most wide open spaces are always inside one’s head. I’ll try to explain more thoroughly soon. For now, that’ll have to do. But at least you know that the Squish is staying out of trouble! Just to wrap up on my previous post on a series of sketches I’d been doing in the print studio. Here is the final version, at least for now, as I’m not sure how or whether to pursue the idea. I’m already working on a different thread, and you can get a preview of small work-ups for that over on my Facebook page. It’s nice to be busy in the studio in mid April (and I have been), because I find the rush of logistical and publicity details somewhat distracting as May winds down, with the first show approaching in June. That will be the Art Students League Summer Art Market, a fun but exhausting show in south Capitol Hill. After that comes The Boulder Open Fest in July on the Mall, a gallery show at Zip 37 Gallery in North Denver in early August, and possibly, the Modernism show at the Stock Show Arena near Labor Day. I guess I should also put in a plug for my 8-week workshop at the ASLD starting in late June. You can search my name for current workshops at any time. A Fall workshop will be announced soon, and you’ll notice a one-day Summer Sampler in August if you just can’t commit the time for the longer classes. I’ve grown quite attached to bright sunny mornings in the Art Students League print room, and I’ve made some great friends there!